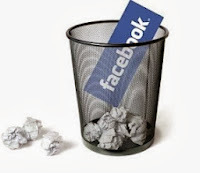 A/A Dear readers, today i am posting "How to Permanently Deactivate / Delete a Facebook Account" Because many of the Facebook users are confused between deleting and deactivating an account. So they don’t find any option and go for deactivating an account. But deactivating and deleting a Facebook account is not the same. What's the difference between deactivating and deleting an account? A lot of people deactivate their accounts for temporary reasons. This option gives them the flexibility to leave and come back whenever they want. Your timeline disappears from the Facebook service immediately. People on Facebook will not be able to search for you. Some information, like messages you sent, may still be visible to others. Facebook saves your timeline information (friends, photos, interests, etc. ), just in case you want to come back to Facebook at some point. If you choose to reactivate your account, the information on your timeline will be there when you come back. You will not be able to regain access to your account again. Most personally identifiable information associated with it is removed from the Facebook database. This includes information like email address, mailing address, and IM screen names. Some personally identifiable information may remain, such as your name if you sent a message to someone else. Copies of some material (photos, notes, etc.) may remain in Facebook servers for technical reasons, but this material is disassociated from any personal identifiers and completely inaccessible to other people using Facebook. Permanently deleting a Facebook account is not available readily. It is not visible easily because it doesn’t exist in your account settings/options. It exists in Facebook help and is very difficult to replace it with your profile link. Please keep in mind that you won't be able to reactivate your account or retrieve anything you've added. Before you do this, you may want to download a copy of your info from Facebook. Then, if you'd like your account permanently deleted with no option for recovery. How can I download my information from Facebook? 3. Click on "Download a copy of your Facebook data"
Now click on the below link to permanently delete your Facebook account. If you do not think you will use Facebook again and would like your account deleted, Facebook can take care of this for you. Keep in mind that you will not be able to reactivate your account or retrieve any of the content or information you have added. If you would still like your account deleted, click "Delete My Account". Now Click on Delete My Account and you have Done. NOTE: If you really want to delete your Facebook Account then submit the above application and do not login into your Facebook account till 14 days.